This featured little-planet, all-sky, double time-lapse, digitally-fused composite captured celestial action during both night and day from a single location. In this 360×180 panorama, north and south are at the image bottom and top, while east and west are at the left and right edges, respectively. During four hours the night before the eclipse, star trails were captured circling the north celestial pole (bottom) as the Earth spun. During the day of the total eclipse, the Sun was captured every fifteen minutes from sunrise to sunset (top), sometimes in partial eclipse. 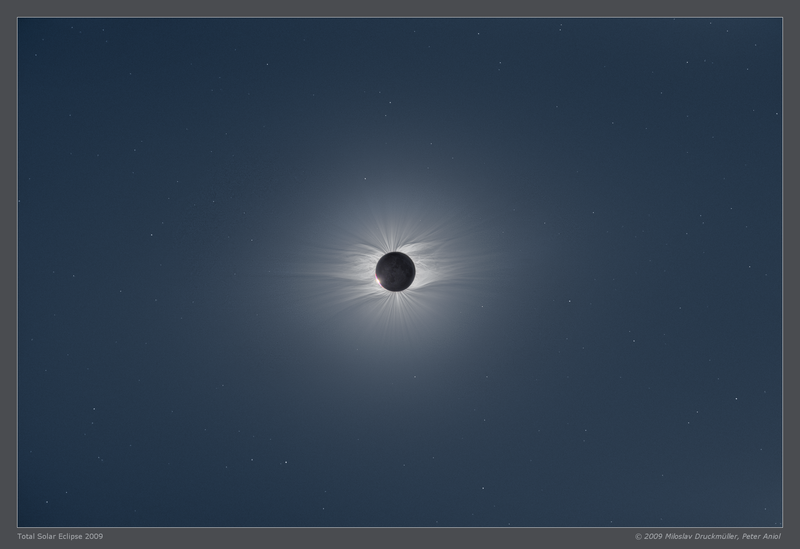 All of these images were then digitally merged onto a single image taken exactly during the total solar eclipse. Then, the Sun’s bright corona could be seen flaring around the dark new Moon (upper left), while Venus simultaneously became easily visible (top). The tree in the middle, below the camera, is a Douglas fir. So, just your typical full eclipse, little-planet, all-sky, double time-lapse photo by a fir tree, really. You can see more of Vetter’s photography on his website. In this new short film, director Alex Gorosh walks us through next week’s total solar eclipse and explains why it’s so important to see it. The mix of archival footage, scientific explanation, and a brief outdoor simulation to demonstrate scale similar to his 2015 video about the solar system, all make a compelling emotional argument that this eclipse shouldn’t be missed. Just make sure you’re prepared. While standing in her backyard garden this morning around 9:20am in Leicestershire, UK, photographer Amy Shore snapped away at a perfectly clear view of a total solar eclipse with her Nikon D600. What she didn’t know until after the fact was that a lone bird was crossing the viewfinder at just the right moment. Via email Shore mentions that as a full-time photographer she normally shoots weddings, and the split-second decision to take this shot was a happy accident. It’s not immediately clear if there happened to be a weasel riding on the bird. This eclipse was the first viewable over the UK in the social media age and photos, videos, and accounts like this have spread everywhere since this morning. The Guardian in particular had fantastic minute-to-minute coverage. Update: Photographer Andrew Brooks got a similar shot in Manchester.